« The Lost Heroine of District Nursing. Interview with Nurse Connie Byrne. 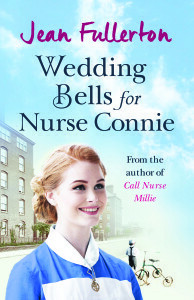 I thought I’d give you a little insight into Wedding Bells for Nurse Connie by interview Sister Connie Byrne. It’s 8am in the morning and I’m going to have a few words with her as she chains her bicycle up in the backyard of Fry House. Me: ‘Good morning, Sister Byrne, can you tell me what you’ve been up to this fine morning? Nurse Connie. ‘What I’m usually up to when the phone goes at 3am in the morning: delivering a baby. Me: ‘Of course, it’s the 5th July and the new health service starts today. Nurse Connie. ‘I certainly am. I’m sure there isn’t a district nurse or midwife in the land who doesn’t hate charging a desperate mother with a poorly child for a visit or taking the last few coppers from an elderly person who need a bit of help to the toilet. And I for one won’t be sorry that from today I can throw my weekly collection book in the bin. Me: ‘You mentioned a safe delivery before so as Spitalfields hasn’t got the nicest of reputations aren’t you concerned for your safely cycling alone around the streets in the wee small hours? Nurse Connie. ‘Not at all. I’m a local girl and have known theses streets all my life and in fact, in my uniform I feel safer than at any other time. One of the nicest things about being a District Nurse is people have a great deal of affection for us. More than once I’ve come back to my bike after visiting a patient and found a bun or a couple of oranges wrapped in a paper bag have been slipped into my basket so I feel very safe riding around the patch at any time.